In 2016, Measurement Resources conducted an impact evaluation of So Others Might Eat’s (SOME) housing program. 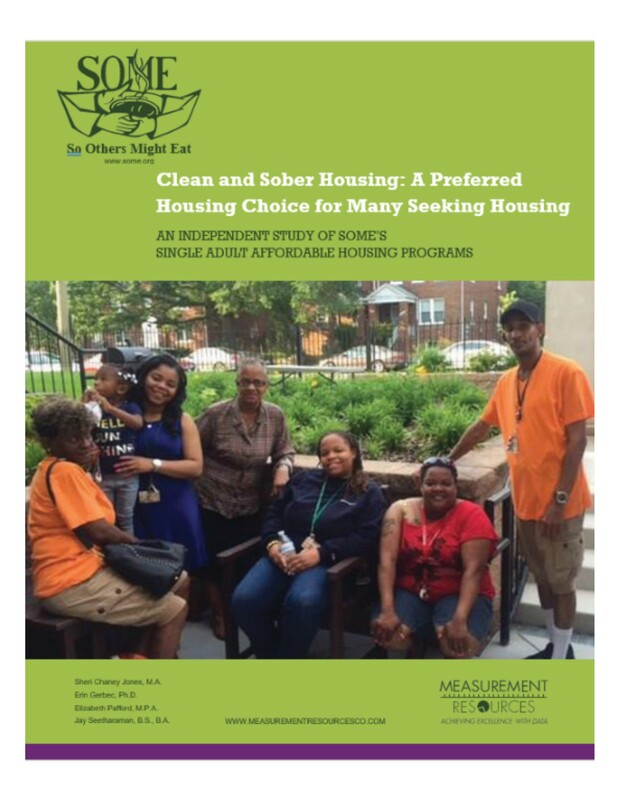 SOME provides single adults in Washington, D.C. with safe, affordable, long-term, supportive housing through its Affordable Housing for Single Adults program, or Single Room Occupancy (SRO) housing. SOME’s SRO program goal is to help residents find a way to live a better life. Longer term goals of the program are to see residents permanently set free from addictions, homelessness and emotional despair. One way SOME achieves this goal is to follow a supportive housing model in which programs and services are delivered in a clean and sober environment. To better understand the needs and experiences of SRO residents, SOME partnered with Measurement Resources Company (MRC) to assess the opinions and attitudes of residents as it relates to their housing program activities, implementation, and effectiveness. The results of the study allowed SOME leaders to better understand residents’ experience with the program, identify key benefits of the supported housing model, and identify specific areas where the program can be improved. After the results were presented, SOME leaders believed these results had value for the rest of the housing field, and partnered with Measurement Resources again to develop a white paper highlighting the impact of these findings.